Web Coding: HTML, PHP, CSS, and WordPress. 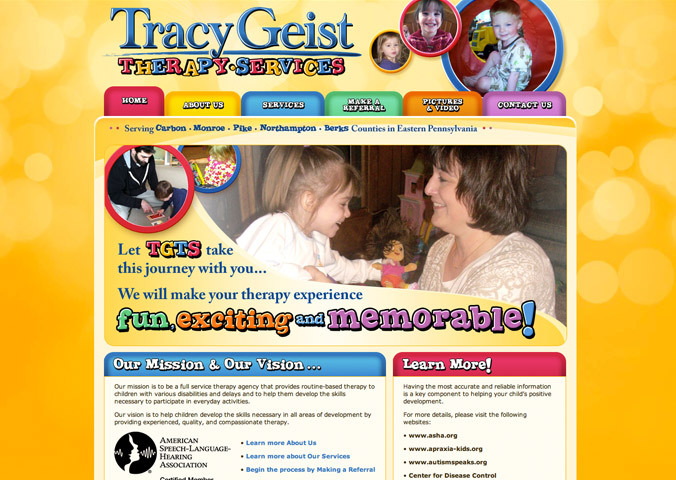 In winter 2012, Tracy Geist Therapy Services enlisted Kernie Cam Productions to design and program a new website for the Pennsylvania-based child-therapy agency. Aiming for a fun, colorful, and child-oriented style while maintaining the professionalism of the agency's therapists and employees, Kernie Cam Productions provided TGTS with a bold and eye-catching new site to help attract new clients and referrals. The site was built using HTML, PHP, and CSS within the Word Press content management system.